A forbidden romance. A modern mystery. Wuthering Heights as you've never seen it before. Chelsea has always believed that her mom died of a sudden illness, until she finds a letter her dad has kept from her for years — a letter from her mom, Catherine, who didn't die: She disappeared. Driven by unanswered questions, Chelsea sets out to look for her — starting with the return address on the letter: The Underground. 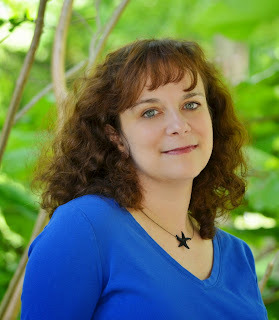 Here April talks about who has inspired her writing career and why! I’ve had so many inspirations—teachers in high school and college, and writer friends I’ve been lucky to make along the way—but my first and most important inspiration was my mother. Though she had to drop out of school in eleventh grade to help support her family, she has always been a voracious reader. When I was small, she would take me on regular outings to the library, or to the Salvation Army and garage sales where I would pick out stacks and stacks of books to take home. When I was even smaller, she would walk around the neighborhood with me, inventing little songs about the things we saw along the way. So I would invent songs and poems too; she made it seem like the most natural thing in the world. And as soon as I learned how, I started writing them down. The books my mother put in my hands were some of my best and most reliable companions. I was a shy and awkward kid, and I distinctly remember feeling more at home in the world of Louisa May Alcott’s Little Women than I did at recess, where the other kids all seemed so comfortable with each other and so good at kick ball and tag—games that interested me not at all. I spent so much time with my nose in a book that my fifth grade teacher actually suggested to my mother that maybe I was reading to escape reality. She was right, of course, but to this day I’m still not sure why she considered that a bad thing! Eventually I started writing novels of my own, by hand in marble notebooks. In high school, I wrote and illustrated a chapter book about a trio of orphans who escape from a dreary orphanage and have to survive on their own in the woods. At the time, my mother worked as an adminstrative assistant, and she would bring my scribbled chapters into work and type them up for me during her lunch break so I could send them to publishing houses. They weren’t accepted for publication, but to this day my mother still asks me about that novel, and insists I should try sending it out again. It’s absolutely no accident that my first published novel was a contemporary retelling of Jane Eyre—my mother’s favorite novel. I picked it up in the first place because she suggested it, and it became my favorite book as well. How could I not fall in love with the story of a shy and awkward kid, misunderstood by those around her, who grows up to be smart and self-reliant and a romantic heroine to boot? From there, I started obsessively reading the classics—losing myself in the poetry and the romance of Wuthering Heights, Romeo and Juliet, Pride and Prejudice, The Great Gatsby, A Room With a View, books I’ve come to love so much that I have to return to them again and again. Writing contemporary retellings of the classics is my way of returning to worlds and characters that still seem as real to me as the 3-D world I walk through every day, just as they did when I was first learning to read. April Lindner is the author of two novels, Catherine, a modernization of Wuthering Heights, and Jane, an update of Jane Eyre. She also has published two poetry collections, Skin and This Bed Our Bodies Shaped. She plays acoustic guitar badly, sees more rock concerts than she’d care to admit, travels whenever she can, cooks Italian food, and lavishes attention on her pets—two Labrador retriever mixes and two excitable guinea pigs. A professor of English at Saint Joseph’s University, April lives in Pennsylvania with her husband and two sons. A hardcover copy of CATHERINE by April Lindner to THREE (3) winners. Giveaway ends July 4 at 11:59 p.m. Mandatory requirement is to leave a comment. 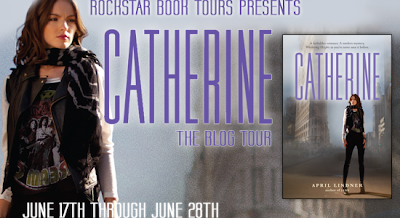 Optional entries are to Like the CATHERINE Facebook page, follow the author on Twitter and Tweet (daily) about the tour/giveaway. All giveaway options are weighted evenly. I always love to see how authors reinvent a classic! Thanks for the giveaway! I love to go through and see the familiar things in the story with the author's specific twist. Thanks for the awesome giveaway! I always love seeing the different way authors can tell the story but still keep in along the classic storyline of telling. I like to see how the authors do it and how it varies from the original but still has the same concept. It's also interesting to see the stories in a more so modern world and how that changes the story. Thanks for the giveaway! I grew up on fairy tales and any sort of variation of them still resonates with me. I have found myself hopelessly smitten with all fairytale retellings. I like modern retelling of classics because they're more relate-able. I find it interesting to see how they incorporate modern aspects into a classic. Example: Technology. I like seeing the characters I love and the themes these classics embody translated to new worlds and experiences. It's great to see the characters again and fascinating to see the themes explored anew. I was also a very shy and awkward as a kid, even now as an adult, so books have been my friends for my whole life. They have offered me confidence to find friends who love books too, that love all of my shy and awkward ways! I have ran across Jane by the author before, but I have not read it. I think that I need to. 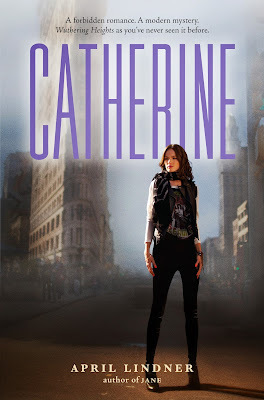 And Catherine sounds very good, too! Oh yeah, one thing that I forgot to mention. I love the cover! It's interesting seeing different people's take on classic stories. Maybe, they imagine things differently than I do. I just love retellings and getting to revisit a story I loved in a different authors view of the story. I always enjoy reading how the author twist the story and makes it believable in the retelling.